DOYLESTOWN (PA) – The Delaware Valley College football team will look to begin a season 3-0 for the third time in the last four years as the Aggies travel to defending Middle Atlantic Conference (MAC) champion Lebanon Valley College on Saturday, September 27. Kickoff at Arnold Field is slated for 1:00 p.m.
Delaware Valley went undefeated in the regular season in 2011 and finished 11-1 while last year’s squad opened the campaign 4-0, en route to a 7-4 mark. This season, the Aggies opened with a 30-20, non-conference win at Montclair State University on September 6 and followed a bye week with last Saturday’s 54-35 home triumph over MAC foe Wilkes University. The win over Wilkes came under the new lights at Robert A. Lipinski Field at James Work Memorial Stadium as a packed crowd watched the first home night football game in school history. They were treated to a great atmosphere and an offensive shootout as the teams combined for 89 points, 168 plays and 972 yards. The game was tied at 35-35 late in the third quarter before the Aggies scored the final 19 points to pull away to the win. It was a record-breaking night for senior tailback Chris Smallwood (Philadelphia, PA/Upper Moreland) as, in just his second career start, he carried the ball 20 times for 213 yards and six touchdowns (49, 1, 5, 42, 34 and 37 yards). The touchdown total broke the previous rushing score mark of four held by several plays and the overall touchdown record of five set by Harry Capozzoli against Lock Haven back in 1968. Smallwood’s yardage total was also the sixth-highest in school history. Smallwood, who was named the MAC Offensive Player of the Week for his performance, is one of the reasons why the Delaware Valley offense is ranked first in the conference in scoring (42.0 avg), passing (286.0 avg) and total yardage (467.5 avg). He paces a ground attack that is second in the MAC (181.5 avg) as he has lugged the ball 40 times for 274 yards and those six scores. Senior quarterback Aaron Wilmer (Philadelphia, PA/George Washington) followed his 394-yard performance in the season opener by completing 10 of 22 passes for 178 yards and two touchdowns. Both scoring tosses came after Wilkes tied the game at 35-35. Wilmer’s favorite target is fellow senior Rasheed Bailey (Philadelphia, PA/Roxborough), who had a record-setting day in the opener at Montclair State. That day against an All-American cornerback, Bailey tied a school mark with 11 catches while his 216 yards was the fifth-highest, single-game mark. Last week against Wilkes, Bailey had two grabs for 54 yards and he is now just two catches shy of becoming the 11th player in Aggie history to reach the 100-reception mark for a career. Fellow seniors Max Stella (Doylestown, PA/Central Bucks West) and Danny Lopez (Bethlehem, PA/Liberty) caught touchdown passes in the win over Wilkes. Stella, a tight end, had two grabs for 29 yards, including a 16-yard scoring grab in the third quarter that put the team ahead for good. Lopez, a wideout, had one catch and it was 27-yard touchdown on the first play of the fourth quarter. It was his first collegiate touchdown. 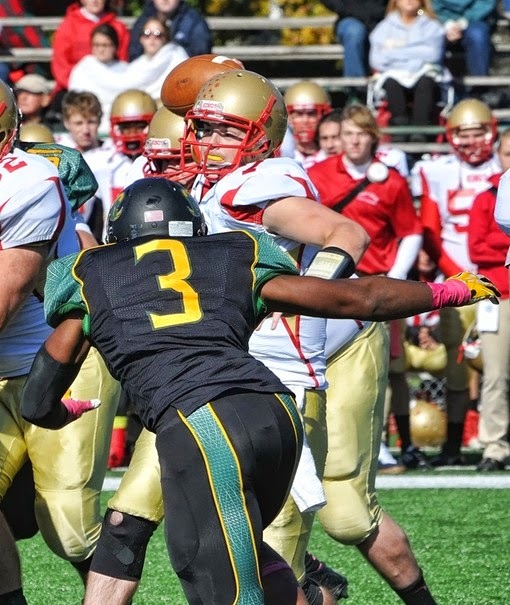 On the defensive side of the ball, Delaware Valley is allowing 27.5 points and 467.5 yards per game. Against Wilkes, the unit kept the Colonels out of the end zone on their final four possessions after the game was tied at 35-35 (one punt, three turnovers on downs). All-conference safety Danny Wynne (Hatfield, PA/North Penn) leads the team with 20 tackles, including a team-best 12 last week. The junior also has two pass breakups and a forced fumble to his credit. Linebackers Frank Law (Wayne, NJ/Wayne Valley) and Rashaad Lighty (Pottstown, PA/Pottstown)follow with 19 and 17 tackles respectively. Law, a sophomore had a career-high 11 stops last week while Lighty, a junior who is back at his natural outside position after moving to defensive end last season, added 10 tackles and two sacks. He has a team-best four sacks on the year. Juniors Matt Smith (Lansdale, PA/North Penn) and Keith Jenkins (Philadelphia, PA/Prep Charter)are coming off strong efforts against Wilkes. Smith, a linebacker, had eight tackles, one interception, one forced fumble and one fumble recovery. He has 12 stops on the year. Jenkins, an end, had four tackles, two sacks and one pass breakup to give him six tackles, two sacks and two breakups on the year. The Flying Dutchmen went 8-3 last season, en route to their first MAC title since 1969 and their first-ever NCAA berth. One of those triumphs was a 34-31, overtime victory at Delaware Valley, the team’s first win against the Aggies since 2002. This year’s Lebanon Valley squad has already matched their 2013 loss total as the Flying Dutchmen are winless at 0-3 with setbacks to Franklin & Marshall College (28-21), Widener University (45-3) and Stevenson University (20-14). The Stevenson game last Saturday saw Lebanon Valley fall behind 20-0 before making a late comeback that fell a touchdown short. The Flying Dutchmen offense is seventh in the MAC in scoring (12.7 avg) and eighth in total yardage (228.0 avg). Heading the unit is senior quarterback Brian Murphy, who has completed 41 of 86 passes for 441 yards and five touchdowns. He was 16-for-25 for 146 yards, two touchdowns and two interceptions at Stevenson. Fellow seniors Tyler George and Darryl Sweeper are Murphy’s favorite targets. George has 17 catches for 27 yards and four touchdowns, including last Saturday’s five-reception, 52-yard, one-touchdown effort. Sweeper hauled in four passes for 31 yards at Stevenson to up his season total to 11 catches for 137 yards. The Lebanon Valley ground attack is paced by sophomore tailback Brendon Irving. Irving has carried the ball 53 times for 205 yards, including 72 yards on 24 touches in the loss at Stevenson. Defensively, the Flying Dutchmen are fourth in the MAC in total yardage (306.0 avg), fifth in both rushing (133.0 avg) and passing (173.0 avg) and eighth in scoring (31.0 avg). The unit is led by All-American linebacker Frank Gaffney, who led the country last season with 13 solo sacks. This year, the senior has 32 tackles and 1.5 sacks with 13 stops and half a sack coming against Stevenson. Another defensive player to watch is senior cornerback Zach Wierman. Wierman was named to the MAC Honor Roll after intercepting two passes and returned them for 59 yards at Stevenson. He also had five tackles to up his season total to 11.